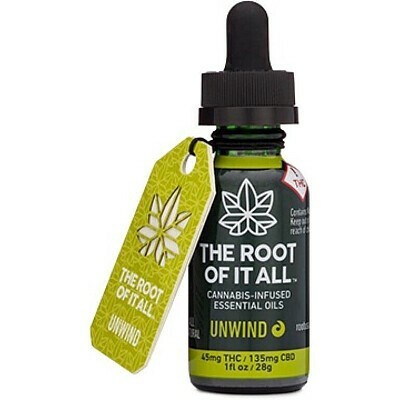 THE ROOT OF IT ALL- Unwind 3:1 Essential Oil Tinctures, Order Weed Online From East Of Eden Cannabis Co. UNWIND FOR RECHARGING// 1 OZ// Rejuvinate your mind and body with UNWIND for recharging, This essential oil is blended with a 3:1 ratio of CBD to THC to revive your senses after mentally and physically draining days. Easy to use and a delight for the senses, UNWIND is infused with Ayurvedic Ingredients: Turmeric, black pepper, and clove; known the recharge and revive your mind and body. Gluten free, Vegan, and allergy friendly.